Here is a picture of the wedding party. Notice the shapeless fitting clothes worn by the older women. All the women have their heads covered in the conservative Muslim Fashion. Except maybe that women to the right in the photo below, wearing the red blouse. And is she wearing pants, too? How did that whore get in there? I guess that's what happens when Sharia Law isn't enforced by the state. Turkey is special in that regard, and I hope it continues to be, despite changes the AKP is attempting to make to Turkey's constitution. The bride looks happy enough, even if she is wrapped up like a 1950's nun. 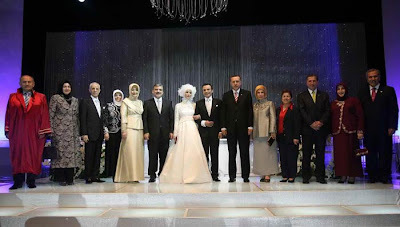 Turkish President Abdullah Gul’s daughter Kubra married Mehmet Sarimermer, son of a businessman, in a ceremony that was held yesterday at the Istanbul convention center, and was attended by thousands of guests. 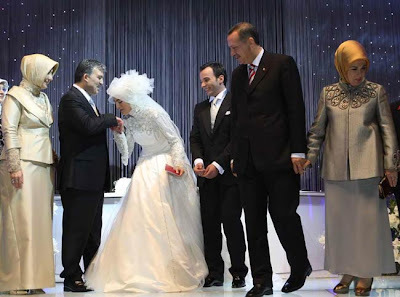 Istanbul’s Mayor Kadir Topbas officiated the ceremony and PM Recep Tayyip Erdogan, the former parliamentary speaker Bulent Arinc and current Speaker Koksal Toptan were the bride’s witnesses. I suppose they do look like a happy wedding couple, even if her dress has a touch of that "Mother Superior" look. Women look more human when you can see their ears, neck and a bit of hair, in my opinion. [...]Developed for Muslim women looking for modest swimwear, the long-sleeve polyester tunic with long pants and a stretchy hood -- the name is a melding of bikini and burqa -- lets women hit the waves without fear of either revealing too much skin or drowning in yards of drenched clothing. The loose-fitting suit, which has won the Australian Islamic Council's approval and is being bought by women across the world "is not just a swimsuit. It's a complete lifestyle change for the better," said Aheda Zanetti, its Lebanese-born Australian designer. Are they having fun yet? Lets hope so! 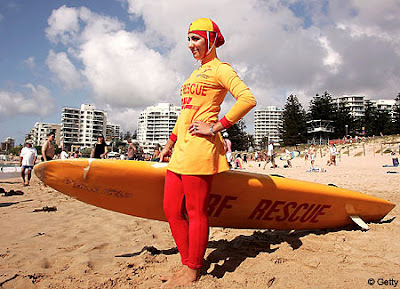 This young Muslim lady actually has a job as a life guard. The "burkini" actually makes that possible for her. Here's proof of just how revolutionary the Burkini really is. Here is Laura Bush meeting with breast cancer survivors in United Arab Emirates. Some burkini's for these ladies would be a great improvement, IMO. The idea that a woman has to cover herself completely implies that men don't (or aren't expected to) have any self-control. What about the concept of a man cultivating himself to be a "gentleman"? And it's not just that I hate it when you can't even see a woman's face; there are also real health reasons to consider. Many Muslim women suffer from vitiman D deficiency, because their skin is not exposed to sunlight enough. Lack of sun exposure can even contribute to breast cancer (Sunshine helps in the fight against breast cancer). I can understand Muslims valuing a woman's modesty; why they don't want their wives or daughters emulating Britney Spears or other Hollywood celebutramps. But surely, there has to be a happy medium somewhere between the thong and the burka, that's still modest but just more comfortable, human and healthy, too. Some women say the hijab makes them feel like they're locked in a cage. But others say it leads to personal freedom. Sarah Hekmati first wore the hijab at age 15 growing up in Detroit, Michigan. She is the daughter of Iranian parents who left Iran in 1979 during the Islamic revolution. Hekmati says the hijab liberated her from some teenage angst: Does my hair look good? Am I cute enough? Should I lose weight? "It gave me a sense of identity," she says. "I really liked the purpose behind the hijab -- a woman covering herself so that a man should know her for her mind, not her body." That purpose can be traced back to the Quran, Islam's holy text, which encourages women to dress modestly, says Faegheh Shirazi, author of "The Veil Unveiled." Some Muslims take the Quran's advice as a command for women to wear the hijab, while others disagree, she says. "The Quran is very ambiguous about whether you have to wear the veil or not," Shirazi says. The hijab, however, actually predates Islam, Shirazi explains. The first known reference to veiling (Shirazi uses the term hijab and veil interchangeably) was made in an Assyrian legal text in the 13th century B.C., Shirazi says. In the Assyrian, and later, the Roman and Byzantine empires, the veil was a symbol of prestige and status, she says. By the 12th century, the veil had been imposed on women in the Muslim world to exclude them from public life, Shirazi says. "A sign of distinction had been transformed into a sign of exclusion," she writes in her book. Read the whole thing for more about the "culture clash". I've expressed my opinions here already. Mostly, I just want women to have a choice. I see the Burkini as basically a good idea, because it gives women more choices. It's a rather clever and smart-looking design, too. As for the rest, well, no doubt the debate will continue. Rima Fakih Crowned Miss USA! Slaves to Fashion or Fascism? Save Snowball from the O.D.F.W. It's bad enough what they have done to Snowball, but what they've done to her offspring, Bucky, has pretty much guaranteed his death. GGGGRRR! This is yet just one more story showing how our state government is completely out of control, and needs a major SMACK DOWN. They exist at OUR pleasure, not vice versa. The Dems really seem to be going all out with the children-as-props thing. I guess it saves them from having to talk about FACTS. Emotional appeals are so much better, you don't need to think, just react. Candidates for president have plans to get more people health insurance. Some would compel us to buy it; others would use the tax code to encourage that. Regardless, insurance is the magic that will solve our health-care problems. But contrary to conventional wisdom, it's not those without health insurance who are the problem, but rather those with it. They make medical care more expensive for everyone. We'd each be better off if we paid all but the biggest medical bills out of pocket and saved insurance for catastrophic events. Truly needy people would rely on charity, not government, because once government gets involved, unintended bad consequences abound. If people paid their own bills, they would likely buy high-deductible insurance (roughly $1,000 for individuals, $2,100 for families) because on average, the premium is $1,300 cheaper. But people are so conditioned to expect others to pay their medical bills that they hate high deductibles: They feel ripped off if they must pay a thousand dollars before the insurance company starts paying. Five years ago, the Whole Foods grocery chain switched to a high-deductible plan. If an employee has a sore throat or a sprained ankle, he pays. But if he gets cancer or heart disease, his insurance covers it. Whole Foods puts around $1,500 a year into an account for each employee. It's not charity but part of the employee's compensation. It's money Whole Foods would have otherwise spent on more-expensive insurance. Here's the good part for employees: If they don't spend the money on medical care this year, they keep it, and the company adds more next year. It's called a health savings account, or HSA. (bold emphasis mine) The article goes on to describe the many ways this plan has worked out to benefit both the employer and the employees. I have high deductible health insurance, and a Health Savings Account. All my deductible medical expenses can be paid out of that account; Dentist, Optometrist, Doctor, Chiropractor, even Acupuncture if I want it. With insurance, I'd have to have separate Dental insurance. Eyeglasses or contacts are not always covered. Alternative medicine like Chiropractic and Acupuncture are often not covered by insurance. The HSA account allows ME to choose the kind of care I want, and how much I want to spend on it. Last year I had a severe gall bladder attack; before the year was over, I had surgery to have it removed. I used up all the money in my HSA account, but not long after that, my high deductible insurance kicked in, so I didn't end up spending a lot out of pocket. But I was also in charge; I wasn't sure I wanted the surgery, and was able to explore options and have addition tests, because I was paying for them, not the insurance company. That experience has made me a BIG believer in HSA accounts. Read the rest of Stossel's article to see the affect this freedom has had on Whole Foods Employees. The freedom to choose works out best for everyone. I feel sorry for the kids; it's not their fault that their parents couldn't be bothered to buy health insurance, but spent their money instead on things like business real estate and private school tuition for their kids, among other thingsWhat a sham. It would seem the parents feel entitled to spend their money on luxuries, while the rest of us pay for their insurance. The Media was there while Hillary was using this child as a prop, but where were they when the real sordid story broke out? Do you want to know the basics of repairing Windows systems with Knoppix Linux? You should. It's incredibly useful information to have, since with Knoppix, or other live CD-based Linuxes, you can do life-saving surgery on near-dead Windows systems. I've done it several times myself and I've meant to get around to writing an introductory how-to on the subject. So much for that idea! Scott Granneman has beaten me to it with his excellent story, Fixing Windows with Knoppix, in our sister publication, Extreme Tech. [...] The new 0.4 version of SystemRescueCd was released on Oct. 4. This new edition focuses on disk partitioning, Vista support, and data rescue tasks. In the past, we've found SystemRescueCD to be the best of the best when it comes to repairing troubled systems. We see every reason to believe that this version will be even better. These can be downloaded for free. And if nothing else, a live Linux CD can easily help you rescue your data from an otherwise inaccessible hard drive. Every computer user should have a Linux live CD handy. Geese Police: It's a Geese of a Home Business! [...] About fourteen years ago, David Marcks never thought that chasing geese as a way to keep his hyperactive dog busy could become a lucrative business. David, then 23 years old, was working as a golf course superintendent in Greenwich, Connecticut. As he recalls, "I had a problem with 600 geese residing on the golf course." They tried several options: goose-repellent chemicals that don't always work, to streamers or other "goose-frightening" props that altered the appearance of the golf course. Killing or injuring the birds was out of the question. At the same time, he got his first Border collie. After trying various approaches unsuccessfully, he stumbled on the idea that he could perhaps train his dog to drive off the geese. "I contacted the American Border Collie Association, told them about what I want to train the dog to do and they thought I was a lunatic." It worked! As David proudly recalls, "Once I had my dog for 6-8 weeks, I didn't have any geese on my golf course. Of course my neighboring golf courses suffered greatly because all the geese went someplace else." With the geese gone, however, a new problem popped up. David had a new problem: what will he do with the dog? "What nobody told me when I got my dog was that border collies make lousy pets. Now we had this highly intelligent working breed dog with nothing to do. She was driving me crazy. She was chasing squirrels, rabbits, golf balls, etc. Once I had a little irrigation break on a green, and she was being difficult, more so that particular day, so I put her in my office. I left for 20 minutes, and went down to the golf course and checked on the problem. When I came back, she ate my office - I mean literally -- my desk, the chair, the garbage can, and three sets of computer cables." While some may have gotten rid of the dog, David thought otherwise. "I know she was a great dog; but she just needed to be kept busy." What David did next laid the ground for Geese Police. He offered the services of his dog to herd away the geese in neighboring golf courses, with no charge for the service. After all, it was simply a way to keep his dog busy. "I asked the neighboring golf course if they had any problems with geese. So I brought my dog and introduced her, and asked if I could possibly stop by every morning before work, during lunch and after work to herd the geese off the golf course. They agreed. So that's what I did. Everyday, I dropped by before going to work, then came back during lunch break and after work and herd the geese off another golf course." Four to six weeks later, the neighboring golf course didn't have any geese on their property. So David was back to square one. His dog had again nothing to do. "She was being a menace and I have to look around for something for her to do." Word about David and his dog started to spread among golf course operators in Connecticut. Another superintendent was playing in the neighboring golf course that David and his dog serviced. With the noticeable absence of geese, he asked the superintendent whatever happened to the geese. The superintendent replied, as David recalls, "Oh you've got to see it. This kid comes down and he has this dog. They come down here and drive away the geese." The guy called up David and said, "I'd pay you to chase the geese off my golf course." Read the whole thing, to see how what started out as just a way to exercise his dog, has grown across state lines and evolved into a multi-million dollar business that supports over 40 families. [...] Geese Police, Inc. now has over 35 specially-trained dogs, services clients throughout New Jersey and Rockland and Richmond counties in New York, and franchised its business concept throughout the country from 1998 to March 2003 when it sold to GPI, LLC. the right to use the Geese Police System and marks. GPI, LLC currently offers franchises. ... and the cult's disciples have metal skewers stuck through their bodies and pounded into their heads. Nice. I once read an article by a Turkish writer who mentioned that Turkish Islamists liked fluorescent bulbs, but I didn't think that meant EATING them. The mainstream, top selling Turkish daily Hurriyet published today photos taken from an Islamist CD that is selling like hot cakes in the southeastern city of Sanliurfa, for about $1.50 each. And what do you call this? Literally pounding religious indoctrination into your followers heads? 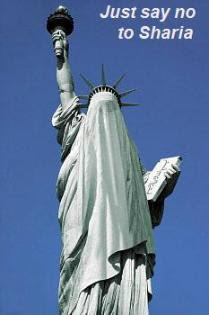 Do you really need to put a hole in the head first, so you can just pour the Islam in? Many people in Turkey fear that the old "backwardness" within Turkish Islam is reasserting itself. This is probably one good example of why those fears exist. 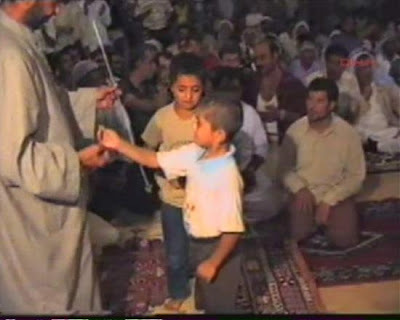 They may call it religion, but it looks like child abuse to me, at least when kids are involved. They aren't all little kids, many are teens and young men... which probably encourages the kids to try it? There are photos with younger kids, but I can't see exactly what's being done to them. Follow the link for more gross pictures, and links to the source, with links to even more photos. If you can stomach it. 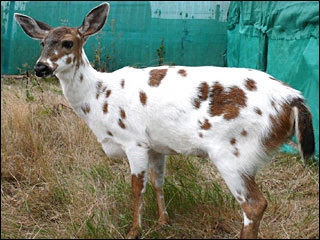 I've seen this piercing thing before, in India yogi's do that kind of thing. 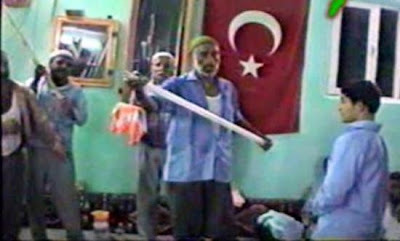 But the fluorescent bulb eating... yet another new use found for modern technology by Muslim fanatics? I can't explain it. These folks, IMO, have WAY too much time on their hands. [...] Make no mistake, I am no fan of Savage, and I consider Limbaugh, as many do, a water-carrier for President Bush, but this is obviously wrong on a multitude of levels. On one hand you have government attempting to intimidate public voices into silence because they do not like a political message. Hugo Chavez is engaging in this very activity in Venezuela with the shutting down of televisions stations he does not like to silence their independent message. Principles and values are simply slogans when applied only when convenient, or to situations with which we agree. Nihilistic leftists like George Soros and those who run his sewerline Media Matters know their message anti-American message of socialistic hopelessness will never survive in America if we have avenues where the issues can be freely discussed, out from under their dead hand. This is nothing new, however. My first book, The New Thought Police, illustrated this tactic and warned of the American left's incresing reliance on fascist theory and application. (bold emphasis mine) If you read the whole thing, it has links and quotes from articles about the attacks. I've read Tammy's book "The New Thought Police", and she knows of what she speaks. The Democrats seem hell bent on advancing their Thought Police Agenda. They HAVE to. Their ideas can't survive open debate, so the solution is to prevent debate from happening. Silence your oppositon using any means possible. 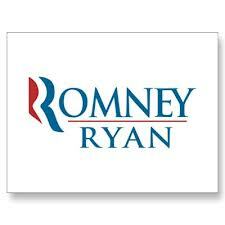 It's the favorite tool of fascists everywhere. Women's voting patterns, Jesus, American Culture and Fred Thompson. Don't miss it! Threats made over Chelsea Clinton Photo? (CBS/AP) The days may be numbered for a photo of Chelsea Clinton posing with the owner of a popular Italian restaurant. That's because Chelsea's dad has weighed in. Former President Bill Clinton sent a letter to Osso Buco proprietor Nino Selimaj, demanding that he take down the picture from the walls of his Greenwich Village restaurant. "I was surprised to get the letter because the picture has been there a few years," Selimaj told The Associated Press on Wednesday. "She's eaten here a few times." The Sept. 18 letter from the office of William Jefferson Clinton says Chelsea is a private citizen and that although she may have eaten at the restaurant "this does not serve as an endorsement." The letter, signed by Clinton counselor Douglas J. Band, says Chelsea "was not consulted prior to this picture being displayed, and thus, her permission was not given for you to do so." "We reserve the right to exercise any and all options available to us if you refuse to comply," the letter says. Selimaj notes that celebrity photos in New York restaurants are common: He also has pictures on his walls of him posing with former mayor and GOP presidential candidate Rudy Giuliani and New York Yankees star Derek Jeter. "A photo of a celebrity in New York is as common as a hot dog vendor," he said. I'm not shocked or surprised. I could personally care less about this, but it IS a bit curious, from a Public Relations perspective. With Chelsea's mom running for president, why make a fuss, sending threatening letters from lawyers about a photo in a restaurant, especially when celebrity photos are so common in NYC? 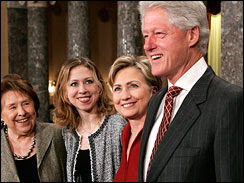 The Clintons seem to have a habit of acting needlessly heavy-handedly. In a "Give one Get one" offer, where you have to buy two, one for yourself, and one to donate, at a total cost of $400. OLPC Give 1 Get 1 Program: XO-1 Laptop USA Sales!!! You can get one in time for Xmas. But only the first 25,000 sold in the first two weeks will be guaranteed for delivery for the Holidays. They may run out of stock quickly. The XO laptop was originally going to cost $100, but in order for the price to be brought down that low, they need to have orders for manufacturing large quantities. So why aren't they offering it for sale to American schools first, and schools in other developed nations? They already have the infrastructure to support the units, and they also have the MONEY to buy them. Could OLPC Sell XO Laptops to US School Systems? And there's no need to think only in terms of schools. If volume orders are needed to bring production costs down, then just sell it retail. The more units sold, the better. [...] But what would be the best way for One Laptop Per Child to sell its "$100 laptops" to American parents that would also support the OLPC Mission? eBay XO-1 sales wouldn't be practical at the scale of demand OLPC has generated. eBay is only a transaction site, it has no distribution system itself and would have to partner with FedEx or UPS to get laptops to buyers. Dell Computers might seem a good partner, they have the distribution network and sell Linux laptops already, but Michael Dell isn't sold on the OLPC goals. CompUSA is my choice. Not only does it have distribution capacity and could offer maintenance plans, its owner Carlos Slim, already bought 250,000 laptops for OLPC Mexico for use as eBooks in libraries. OLPC has been treating the program as an education program, not a laptop program. That has been holding back sales and production. They would probably be better off just selling the laptops first, letting people do what THEY want with them. OLPC can pursue their "constructionist" education agenda later, once the units are established in schools and in use world wide. The way they have been approaching it is like putting the cart before the horse, and it's getting them nowhere. As it is, I don't know how many units they will sell with their current plan. I wouldn't buy one, presently. It will be interesting to see how many people do, and how well it's received. Some good advice, that OLPC project would do well to heed.